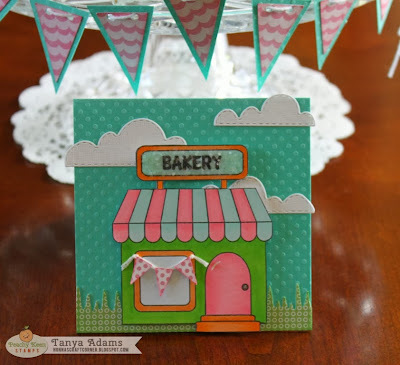 Studio 5380: PKS Challenge - "Potluck"
Hello and welcome to Nonna's Craft Corner! Create a 3D object of your choice following the theme Potluck. Ever gone to a potluck and had no clue what a dish might be? Here is your chance to make an item to give a heads up of what your dish is. It could be toppers, placards, a banner, or anything else that sparks your creativity! Or maybe you have an awesome way to display your dish, that would work too. Use your amazing creativity to make a run with this challenge!! Don't those cupcakes look yummy? It was all I could do to wait until I took pictures before biting into that "Hunka Chunka Banana Love" cupcake! Let me tell you...it was worth the wait - YUM! 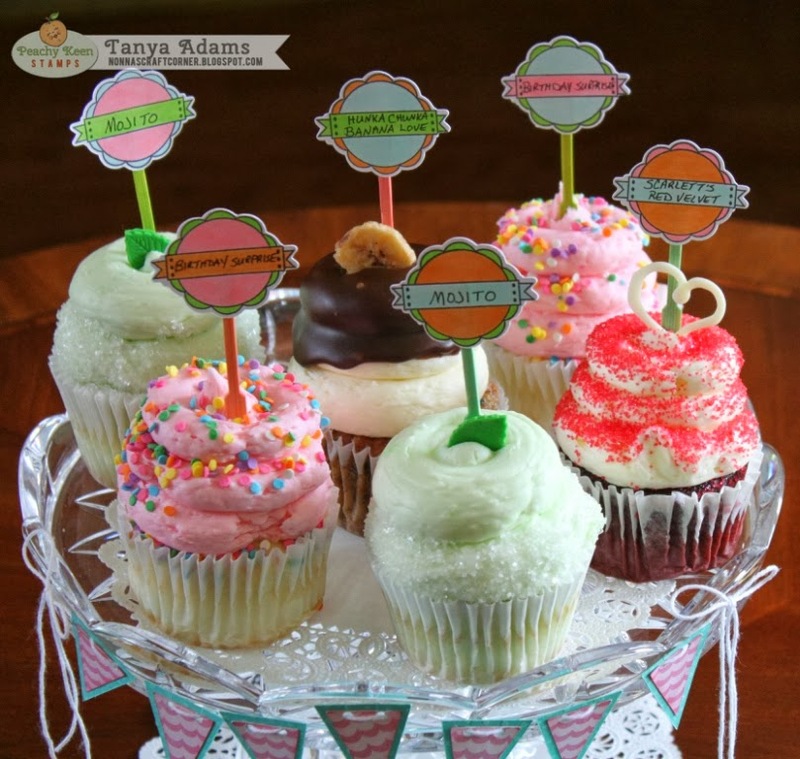 To make the toppers for my cupcakes, I used the label stamp from Peachy Keen's September Stamp Club set. After coloring them with my Copic Markers, I colored a few toothpicks then just glued the label onto the toothpick. The banner is from Pretty Paper, Pretty Ribbons and I attached it to my cake plate using glue dots. 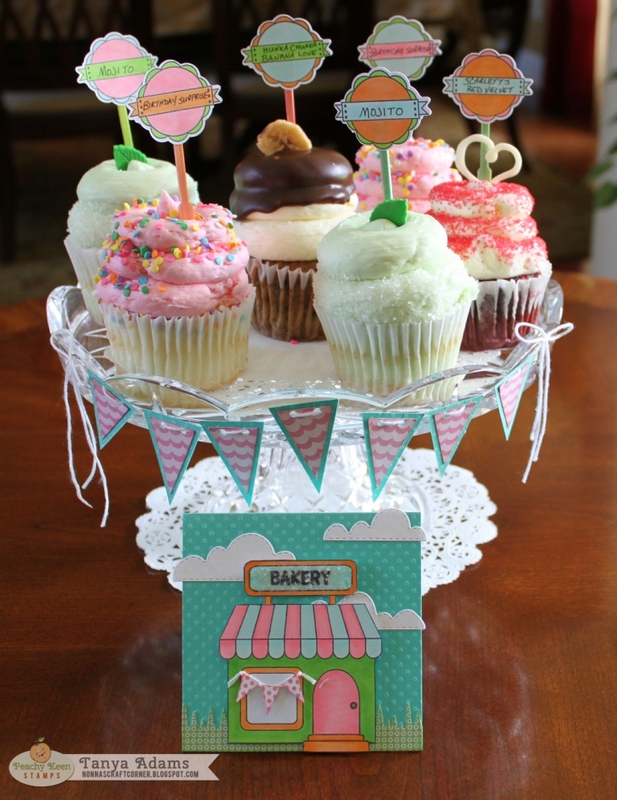 I also made a little card to place in front of my cupcakes using the fun "Sweet Shop" stamp. I colored up the bakery with my Copic Markers and added a little banner to the window for fun. The clouds are from the "Stitched Cartoon Clouds Die" from My Creative Time". That about wraps up my project for this week's challenge. Don't forget to stop by Peachy Keen Stamps to see what the other Designers have put together for your inspiration (I happen to know there are some awesome creations for you to see). I hope to see your Potluck creation linked up with us very soon! This is adorable, Tanya. Cute presentation and I love the papers. Great mood lifter! Tanya ~ Alright I should arrive at your house in less than 5 hours! I hope there are some cupcakes left! This is seriously too CUTE and YUMMY looking! WOW! Have a great weekend and HAPPY FIRDAY!!!!!! Just adorable...I'll come too...but...what about everybody else's cupcakes? Yummy!! I am flipping over your project!! How fun are these toppers!!! And those cupcakes look AWESOME!!! 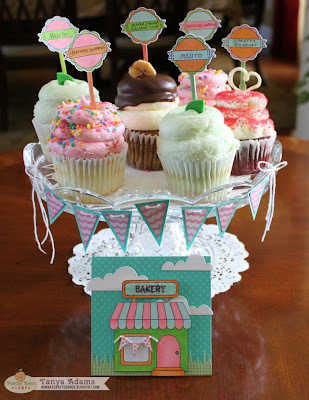 What a GREAT way to display your bakery treats!! Awesome inspiration my friend! Thanks for sharing and have a GREAT weekend! Your coloring is AMAZING! Awesome presentation and YUMMY cupcakes!! The cupcakes are so yummy looking. 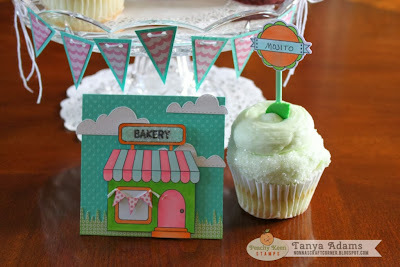 Love the display and the card is too cute. Way to go Tonya. Hello my friend!! I've missed you!! I couldn't wait to come visit and see all the creative goodness I missed while I was gone!! Christmas Card and a Winner!